A major stash-down is underway. That means getting reintroduced to lots of fun wonderful yarn that’s been lolling about in my stash. It also means deleting all those wonderful yarnie emails I get–without even opening them. Ok, that’s a bit militant. 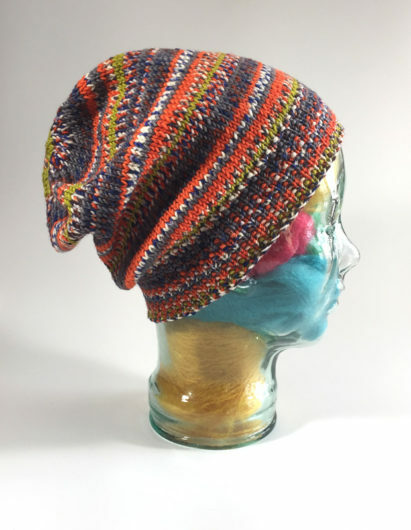 But I’m going to attend a few knitting events in the next several months and my plan is to be sure there are major holes in my stash by the time I get to the marketplaces. So, I’m not feeling one bit deprived. Well, maybe one bit. Still, stash-downing is turning out to be fun. 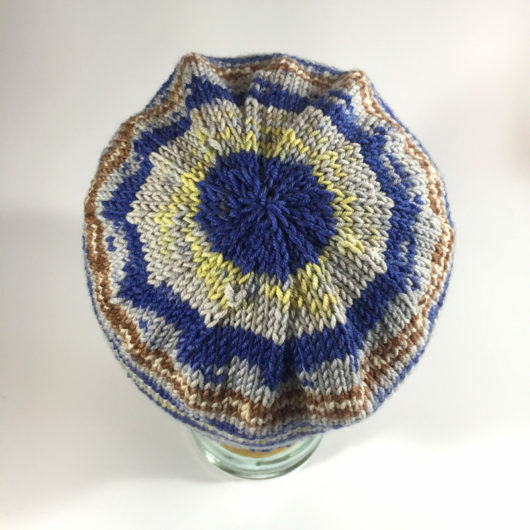 I’m tending to knit small projects and patterns that I’ve knit before. I know. Not everyone’s cup ‘o tea. But what one set of eyeballs sees as garish another sees as daring and colorful. These are my 4th and 5th knits of this pattern, in this yarn. And my friends and family chose all three original knits as holiday gifts. In fact, the one with the orange highlights already walked out my door as a birthday present for a friend’s head. 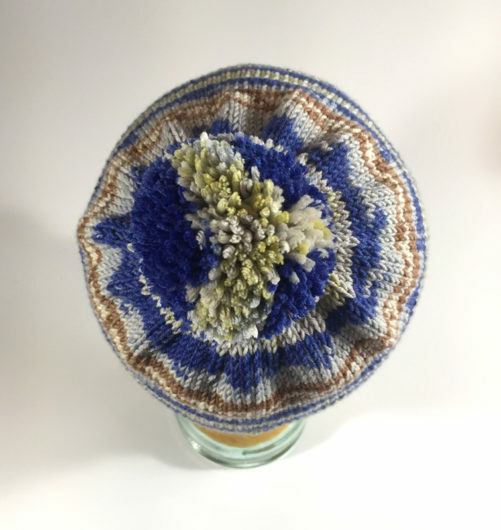 I enjoy that the crowns of these hats, in this yarn, create that flower or bulls-eye. I suppose that what you see might depend on whether your head prefers shooting or gardening. I don’t like either. But I do like this hat. 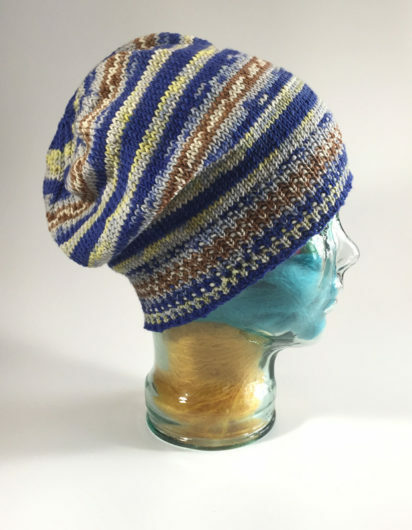 I had three skeins of each colorway and used up the remaining yarn with a simple freebie pattern that showcased this yarn to good effect. 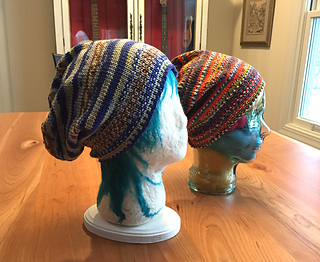 These next hats are Janet D. Russell’s Child’s Self-Striping Hat. The pattern name throws you a bit of a curve on the sizing. 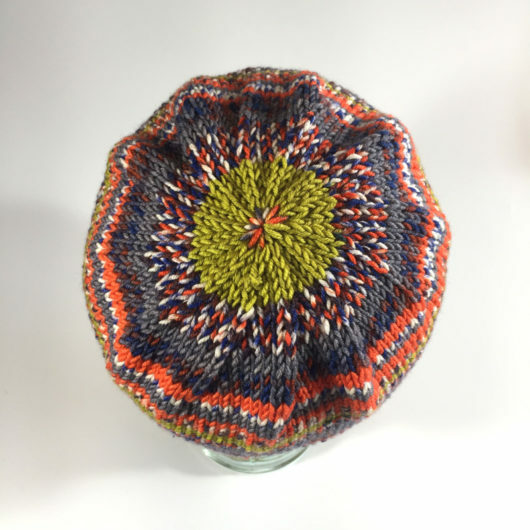 Russell’s pattern includes from an extra small to an extra large. 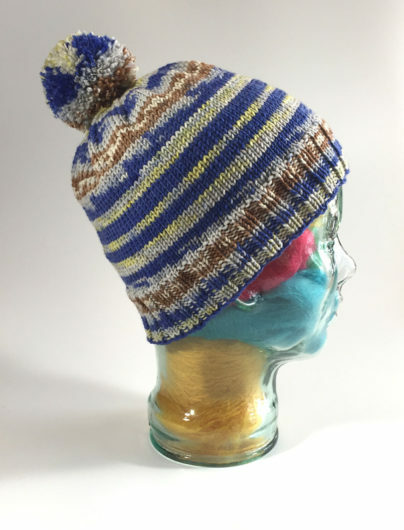 I knit the large, figuring it would work well even for the young ones and used just under 180 yards, DK-weight. Here’s glass head looking all cheerful, as if it hadn’t just recently reached twenty-five below at our water’s-edge weather station. And that’s real degrees, none of that wimpy wind-chill stuff. 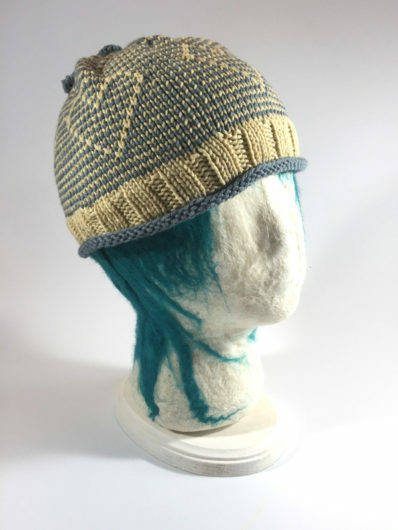 Again, this yarn rewards knitters with an excellent crown. 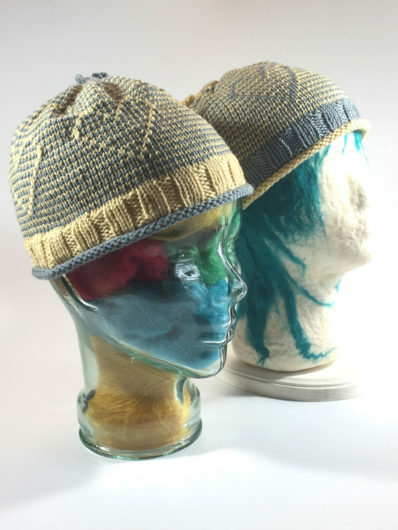 Children are the likely recipients of these hats. I decided to add a pompom to both. Yep, I know that even grown-ups can stick pompoms on the top of their heads if they want to. The pompoms ended up ringed by that nice splash of color. 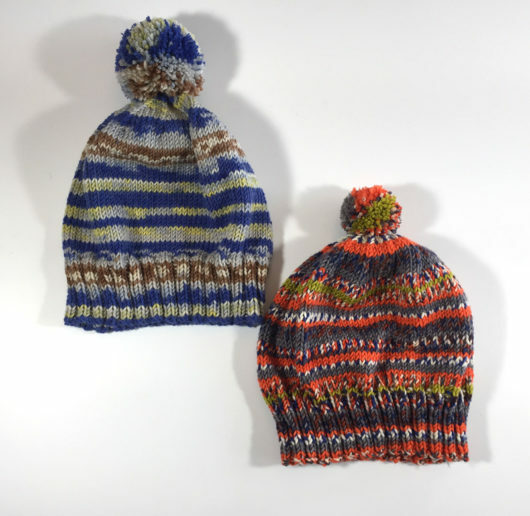 This week, what with February 14th coming up, is a good time to show off a pair of Knitwise Design’s Young at Heart Hats. 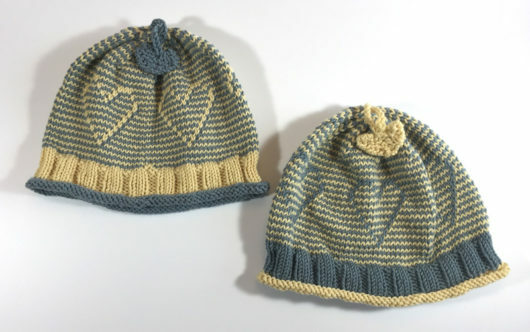 Rather than work with traditional heart motif colors, and consistent with the stash-down underway, I knit these in pastels of Plymouth Yarn’s Worsted Merino Superwash. It works. Good yarn. Great pattern. Those slip stitch hearts are the best. Well, maybe the little dangling heart toppers are the best. 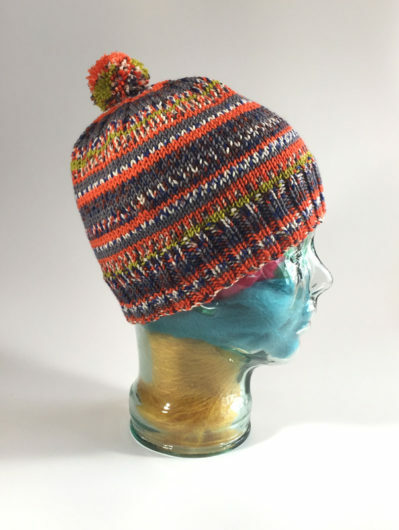 How would we smile our way through the long cold winters without knitting? 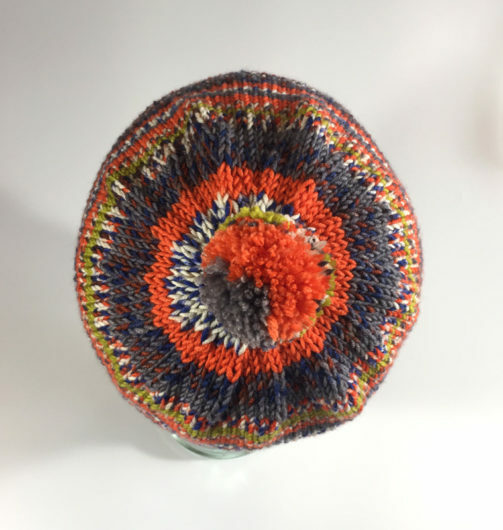 This entry was posted in Knitting and tagged Child's Self-Striping Hat, Janet D. Russell, Jo-Anne Klim, Knitwise Design, Merino Extrafine Color 120, Totallee Slouchee, Young at Heart Hat by Noreen. Bookmark the permalink. Great hats, all of them! Pretty strange weather down here today. First snow, then rain (icy), now getting very foggy. We’ve actually cancelled tonight’s guild meeting because of expected icy roads and snow. Think this may be a first! Hope your weather isn’t too bad. @Harriet…Thanks. We have so much snowing and blowing going on here that we watched a small red squirrel get BLOWN (or so it seemed) off a high tree branch and fall about 25 feet! He rolled and scampered off. Hard to believe, I know.